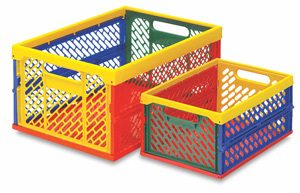 These multicolor, multi-purpose crates have unlimited uses. They start out as flat rectangles with a flat base. Lift up the rectangular top frame, and the slotted side pieces pop up. Easy-carry handles make hauling art supplies a snap. ® Armada is a registered trademark.